Red and Chris played at the Florida Folk Festival over Memorial Day weekend. This is Red's account of the trip. 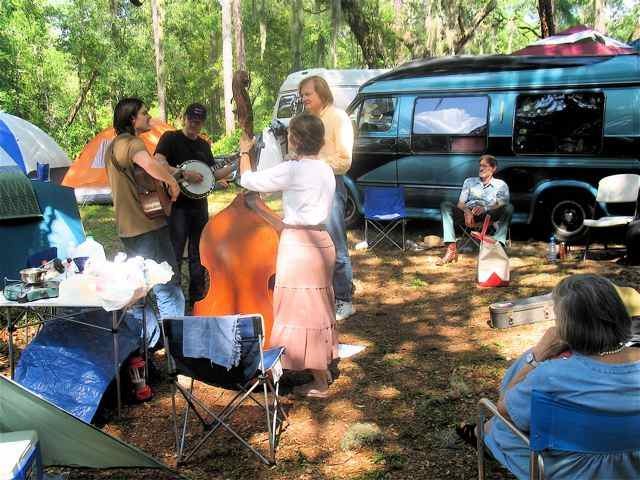 We had a terrific time playing with our band at the Florida Folk Fest at White Springs. All of us--Chris Henry (guitar/mandolin), John Hedgecoth (banjo), Barbara Johnson (bass) and I, say "Thanks!" to all the folks who came out to see us. The Friday night set on the main stage drew a big crowd, and they were listening. On-stage sound was uncertain due to the lack of monitors, but the main mix was good. I had a time getting the crowd to start responding to our stories, but they caught on and really started digging it. We finished up with "Helton Creek," and the folks really liked John's banjo (a pre-war style 75, by the way) and Chris's guitar (hot picking there). Outstanding picking in the campground both Friday and Saturday night-- I didn't make it much after midnight, but certain persons were up till dawn. And they could still stand up the next day! Chris Henry, John Hedgecoth, Barbara Johnson, Red Henry, Dale Crider, Renee Henry. Photo by Ira Winarsky. Our Saturday set was on the Marble Stage, and the place was packed. We put my new tune "Centerville Road" into the set, and the folks liked it. Many thanks to all who heard us and enjoyed the show. We finished out with "Rawhide"-- pretty fast for an old man. Thanks to Michael Monroe for a great mix. We had a lot of good students with good questions at the mandolin and banjo workshops. It makes us feel good if you leave knowing something more about playing than you did before. During the weekend we also backed up our old friend Dale Crider on his sets. Picking with Dale is always a surprise, because he's powerfully creative and anything can happen on stage! John Hedgecoth, Barbara Johnson, Dale Crider, Red Henry, Chris Henry. Photo by Ira Winarsky. Our Sunday set was more relaxed, at a smaller stage. The tent was full with 40 or 50 people, though, and that helped keep up the energy. We included Chris's new tune "Pelham," played on twin mandolins. Really appreciated some of our musical friends who came and listened-- that adds to the both the entertainment and the pressure! I drove Christopher back to Georgia on Sunday night, and he caught a ride back to Nashville with Casey. I got back here to Virginia on Monday, and collapsed for a few days. And I feel grateful. What a great bunch of festivals we've played this spring! -- as Christopher said as we drove home, "Most people don't ever get to do anything like this!" 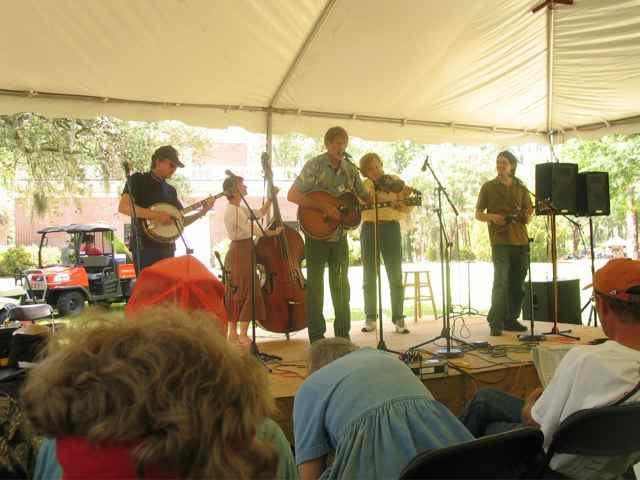 Posted in By Red, shows and tagged florida folk festival, red, shows on July 10, 2008 by Red Henry. Wow! Those certain folks still up at dawn and standing must have been sampling corn from a jar. You’re enjoying life in a proper way and that’s making the world a better place. And you’re right, Chris, most of us will never get to do anything like that. Count your many blessings, and thanks for setting goals for us to acheive. Standards are important.